oo .. it's been a year since i last made a wallie. so here's something for my break. anyway .. this wallie ish dedicated to myrrh-chan .. that's for being such a bishie lover :D hope you'll like it. and to all those whom i did not thank or reply to for the past year, i'm terrible sowwee for not replying and thankew so much for all the comments and favvie on my other wallies. Hiya Kawaii Cicak of Penang! XD I learn quite some malay words during my training! All guys? O_O Its ok though ^_^' Its Awsome ne. Your skills isn't rusty at all. Still as good as usual. ^^v I like the tree out the window. Its fantastic! <3 <3 The vectoring of the *guys* are superb! Not that shabby as you say. XD Hahaha! The photos at the back blends into the Bg! Overall are Excellent for you! Keep it up Lizzie! You always earn my respect for wallies! Hope to see more of your wallies! Always full of fantastic ideas! *Edit* Baka me! There is a girl in the wallie! Stupid stupid me! Don't get angwee ok? Forgive bubu! i don't know how to do vector so i can't give much advice but it is really nice. for the night version. i think you should darken the grass outside. overall, is great and nice. Omg, this is absolutely awesome! I love the vector and the whole background scene. Great choice of the photo pictures too, wow, it's all vectored so nicely. Good job! I love this series...so funny and cute. You did a really good job with the bg...I don't have that much patience. As the the scan of the group, it's really good. You did a good job vectoring it. Nice work. I also like the night version too. Good work. 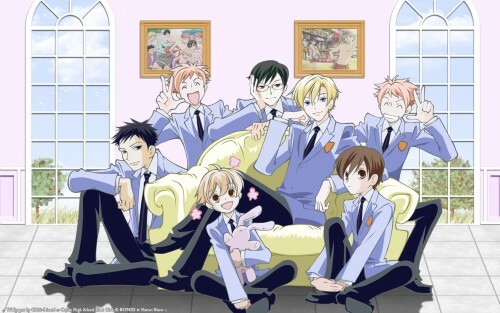 Ouran...glad to see you back, Liz! O.O lizziee! *tackleglompzandhugs* i love it! XD ur vectors are still the best! keeep it up senpai! Nice seeing new artwork from you.. and Ouran is so cool.. ^x^;; ..
WHOA! This looks fantastic lizzie I'm so happy that you decided to vector it too! :D I L-O-V-E how you made the outlines gray colored, and how you changed all the colors a bit in general. So pretty! I also love the floor texture, how did you make that look so good? And the windows are nice, they look fancy enough for Tamaki's house, lol. What did the windows you made before you brother complained look like? Okay, that's not the point. You're finally back witha wall. It's been so long since you last submitted something. Whoa that's so funky. The lighting is amazing. And it looks so awesome. Only the window shadow is a bit too dark. Fave from me, and my new dekstop. thay are cute ! good work! Beautiful! I love the lighting the characters positions, the background looks awsome excellent work please keep sharing it with us!